Andy Pollak (CEO) and Brian Pollak of ADS Management. 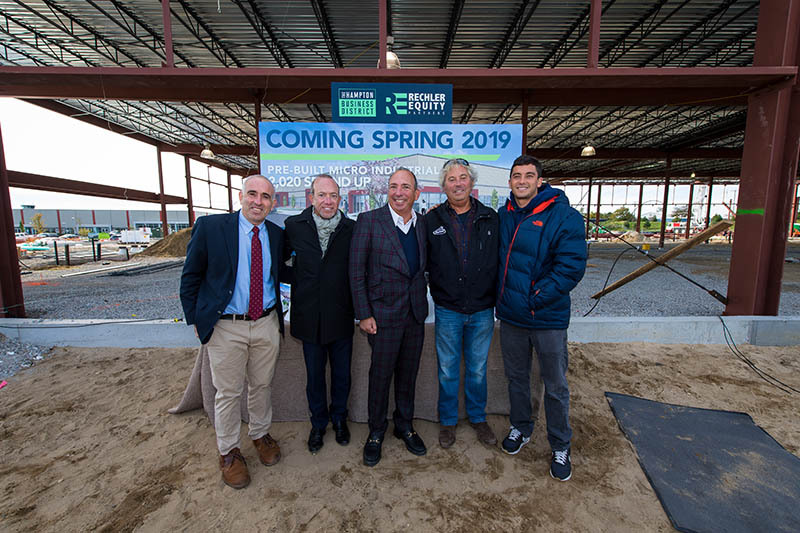 Plainview, NY Rechler Equity Partners, along with Southampton town supervisor Jay Schneiderman and other distinguished guests, celebrated the topping off” of the Hampton Business District’s (HBD) latest round of construction on the parks newest building, 215 Roger’s Way. The newest addition to the HBD represents a $10.8 million investment and is the third of nine planned buildings for the industrial park that has already proven to be an invaluable asset to East End businesses and its economy. Unlike the two other completed buildings, the 66,000 s/f 215 Roger’s Way will offer unit sizes catering to small-sized businesses that require less space than a typical industrial tenant. The new building will feature 13 units ranging in sizes from 2,000 s/f and up to 6,500 s/f. However, a smaller-sized unit does not mean the tenant will have less access to a host of needed amenities for industrial businesses. 215 Roger’s Way will offer pre-built, ready-to-move-in units that feature 15 to 20% office space, 18-ft. ceilings, LED lighting, private loading docks with 10’x12’ overhead doors and sewer connectivity. The topping off celebration also served as an opportunity for Rechler Equity Partners to announce a new anchor tenant filling 215’s dedicated 30,000 s/f of office space. ADS Management—a 4th generation, family owned and operated company that provides a year-round supply of fresh produce up and down the east coast—will occupy 30,000 s/f of the building’s more than 64,000 s/f to establish its new headquarters. Offering full service produce solutions, ADS Management operates six companies that provide fresh produce to major retailers, including 4,000 independent chain stores. The Hampton Business District is the East End’s only Class-A industrial park and is already the home to businesses such as Tate’s Bake Shop, A/C Electric, Carrier Enterprises and the Westhampton Beach Brewing Company. Currently, the industrial park features two completed buildings—220 and 200 Roger’s Way—that collectively represent more than 120,000 s/f of warehouse, distribution, manufacturing and office space.